Melt the butter in a large bowl. Add the brown sugar and whisk until combined. Beat in the egg and both extracts. Gently stir in the salt, cornstarch, and baking soda. Add the flour and stir just until combined. Cover the dough and refrigerator for at least two hours, or overnight. While the dough is in the fridge, unwrap the caramels and cut them in half and pour the sugar on a plate. When dough has chilled, preheat oven to 325 degrees. Roll dough into 1/2 tablespoon balls (a cookie scoop is perfect for this). To make the cookies, sandwich a caramel half between two balls of dough. Squish the dough around the caramel and shape it into a ball. Roll each ball in the sugar until it’s coated on all sides. Arrange the balls of dough on parchment-lined baking sheets and bake for 8 minutes. Remove the cookies from the oven and use the back of a spoon to gently smash them. You don’t want to flatten the cookies or make the caramel show through; you just want to help the caramel spread. Return cookies to the oven for 2 more minutes. Allow cookies to cool on the baking sheet for 10 minutes before transferring to a cooling rack. Cookies are unbeatable served warm, but they’re amazing at room temperature, too. 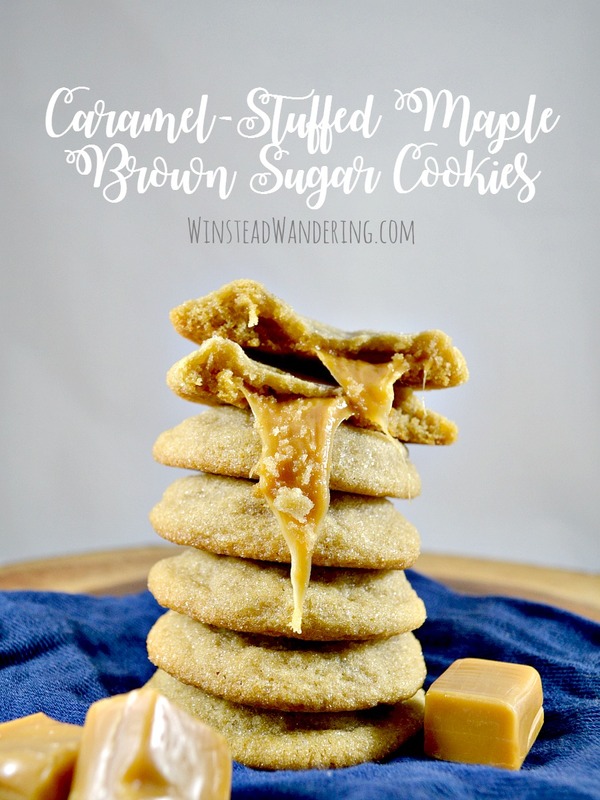 Pin Caramel-Stuffed Maple Brown Sugar Cookies for later! These should definitely be your next sweets fix! Definitely saving this to try once I finally get around to buying flour! I need to just sit down and have a baking weekend. Thanks, Caitlyn! You SO need to have a baking weekend. I’m obsessed with chocolate too…but these look amazing! They are just as good as that dripping caramel makes them look! That last picture is mouth-watering! Wow! My husband doesn’t love caramel, but I say fill ’em to the top with it! These would be so good on a cool fall day! How can he not like caramel!? 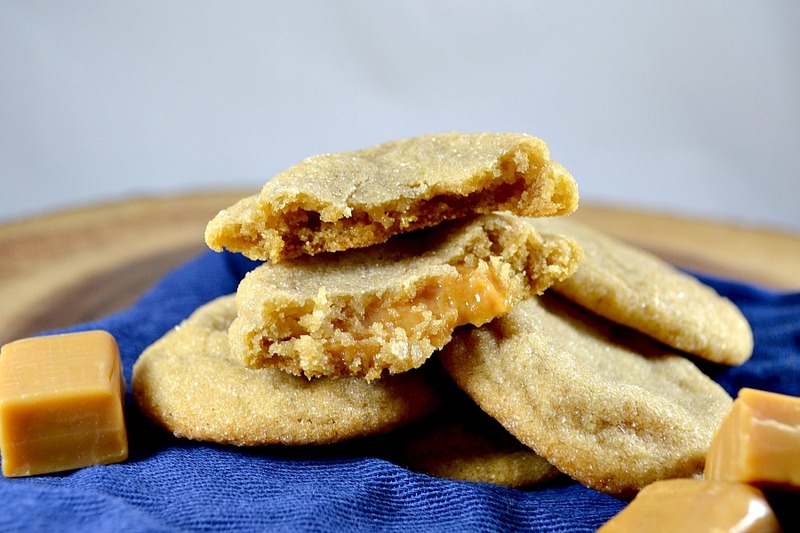 The maple and brown sugar in these cookies mean they’re still super tasty even without caramel. I can’t find Maple extract at any of my local stores. Do you think this would work if I used real maple syrup for part of the sugar? If not, I’ll have to make them without the maple flavor. Hi, Patti! I’m sorry I’m just now seeing this. The cookies would still be amazing if subbed vanilla extract for the maple. I couldn’t find the real thing, either, so I used imitation for this recipe. I’m not sure how the maple syrup would work. Let me know if you try it!